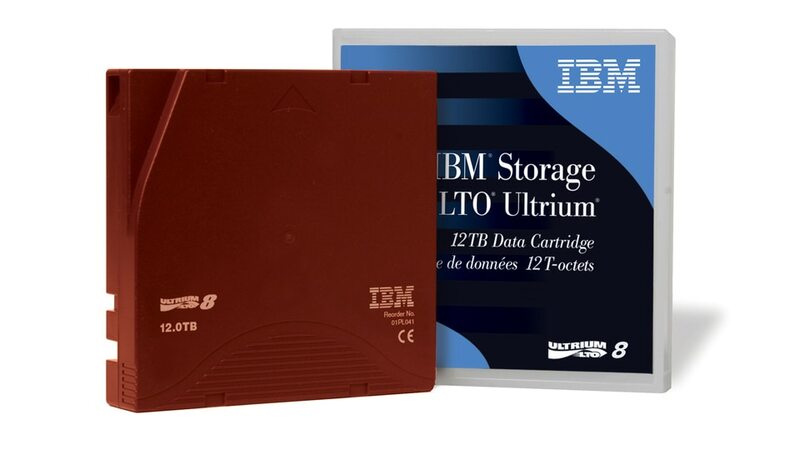 The IBM® LTO Ultrium 8 data cartridge (LTO 8) offers double the storage capacity of the previous generation for long-term data preservation and rapid, reliable access to data. The eighth generation of LTO Ultrium tape media delivers 12 TB native capacity and up to 30 TB of compressed capacity for even greater efficiency and performance. Purchasing LTO 8 data cartridges from IBM gives you peace of mind in sourcing media from a trusted, time-proven tape technology leader. Discover how the LT0 8 can help you manage explosive data growth, sustain rapid, reliable access to data and ensure business resilience. Leverage 12 TB native capacity and up to 30 TB of compressed capacity for significantly greater efficiency and performance, and to reduce the number of cartridges, equipment, space and labor. Allow users and applications to directly retrieve files from tape rather than rely on third-party applications. This improves data access and can reduce software licensing costs and dependencies.